British Scholar, Steve Hilton is the former director strategy of David Cameron, Prime Minister and leader of the Conservative Party in the United Kingdom(2010-2016). He is credited for his creative ideas associated with the modernization of the British Conservative Party. Currently, Steve Hilton is Chief Executive Officer and Co-founder of Crowdpac, Silicon Valley technology start-up. Steve is the author of "More Human: Designing a World Where People Come First" and is also the visiting teacher at Stanford University's Institute of Design and visiting Scholar at the think tank Policy Exchange. Steve Hilton, born on 25th August 1969, is a son of Hungarian Immigrants whose initial surname was 'Hircsak'. His family shifted to Britain after the Hungarian Revolution of 1956. After they arrived in Britain, they claim to be Asylum and later changed their surname as Hilton. Steve enrolled in Horsham with Scholarship in Christ's Hospital School. He joined New College, Oxford (London) and graduated majoring Philosophy, Politics, and Economics. Though he is a British, he belongs to European Ancestry, born in the United Kingdom. Steve begin his political career after joining 'Conservative Central Office' right after his graduation. He gets an opportunity to meet David Cameron and became good friends with each other. He was associated with "Satchi and Satchi", global communication and party's advertising firm where he started Conservative's pre- general election campaign in 1996 with the demon eyes poster campaign called "New Labour, New Danger" which was appreciated by Maurice Saatchi, Iraqi-British Businessman and co-founder of the advertising agencies. In early 1997, this Campaign also received an award from the advertising industry's Campaign magazine. After the labor landslide of 2001, Steve Hilton raised his voice to replace traditional grassroots membership of Conservative Party so that party could avoid metropolitan attitudes.In support, he gives a statement, "I voted Green". Hereby, Steve started working with Cameron and effectively make strategy and constructed progressive Conservative Party. Moreover, on 2nd March 2012, he was announced as visiting Scholar at Stanford University's Freeman Spogli Institute for International Studies for a year by Downing Street.He is now a CEO OF Crowdpac.com which launched a beta service in the United Kingdom. He also supported Brexit Campaign in the support of Hilary Clinton in an American Presidential Campaign. Steve Hilton is also a writer of a book named "More Human", published on 21st May 2016. This book is focussed on Small-Scale Organization which included factory farm and banks. Steve, adviser of ex-prime minister of Britain will come up with Fox News Channel, the one hour -political talk show "The Next Revolution", featuring political talking heads and interviews with the newsmaker in the U.S. This program, launches in May will be based on the uprising populist movement in the United States and airs on every Sunday weekly at 9 pm ET. Despite achievement in his political career, he faced lots of criticism.Steve was called to be crazy and offbeat thinker by deputy Prime Minister, Nick Clegg, which was the major caused for dispute in the Whitehall. He was even satirized in the BBC comedy series "The Thick Of It", based on a political dispute. 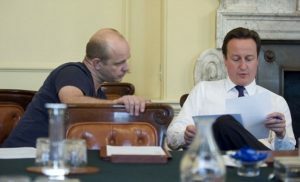 Steve Hilton is a good friend of David Cameron, Britain prime minister but, they had a dispute between them due to immigration and Brexit issues. Similarly, Cameron's effort to make a strong bond with Chinese were also criticized by Steve which made their friendship turns cold. Steve Hilton is a married man. He married his long-term girlfriend turned wife, Rachel Whetstone, public relation executive and Senior vice president of Policy and Communication at Uber. Rachel is the former political secretary to Michael Howard, a British politician who served as a leader of the Conservative Party. She is also the former head of Communication at Google in 2015. Steve Hilton and Rachel Whetstone met at Conservative Central Office where their friendship started and slowly, they started to date each other. They got married in 2008. They are blessed with two children. The couple was also Godparents of late Ivan Cameron, eldest son of David Cameron. Steve is currently living happily with a sweet wife and his sons in their own house in Paolo, Alto, California. The multi-millionaire couple has a rich and prosperous lifestyle and is successful to balance both personal and professional life.